On June 27, 2018, the Legal Aid Ontario Refugee Law Conference was held at the Jackman Law Building at the University of Toronto. 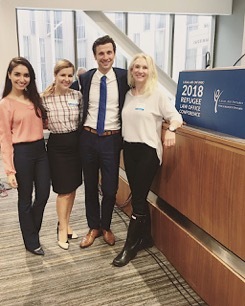 In the spirit of legal excellence and to benefit from the discussion of the wide range of topics regarding the evolving state of refugee law in Canada, Levine Associates attended the Conference. The firm was represented by (from right to left) Ms. Diane Coulthard, Mr. Lev Abramovich, Ms. Olha Senyshyn and articling student Ms. Amna Bhatti. Listening to esteemed speakers like Dr. Hilary Evans Cameron and RPD Deputy Chairperson Shereen Benzvy Miller, allowed the attendees to explore the wide array of challenges in refugee law. The lawyers shared strategies and ideas for dealing with challenging circumstances and helping to shape the future of the refugee system in Canada. The Conference helped lawyers at Levine Associates enhance their professional development and build connections with refugee law community. Initiatives like this surely help lawyers and their staff find new ways to assist clients and improve the efficiency of the refugee system.